Ever wish you could have the luxury hotel maid services at home or office that you enjoy when you travel? Now you can have the cleaning services you need, when you want them! Even on short notice, Maid On Call can send a uniformed maid to perform a variety of household or office cleaning chores, from cleaning your home, bathrooms, kitchens, bedrooms, or daily office cleaning service maidoncall.com is at your service. Maid On Call is proud to offer an all “green”, eco-friendly cleaning service. All our products are the least toxic, biodegradable, environmentally-friendly products available today. These products are also available to you through our online store. 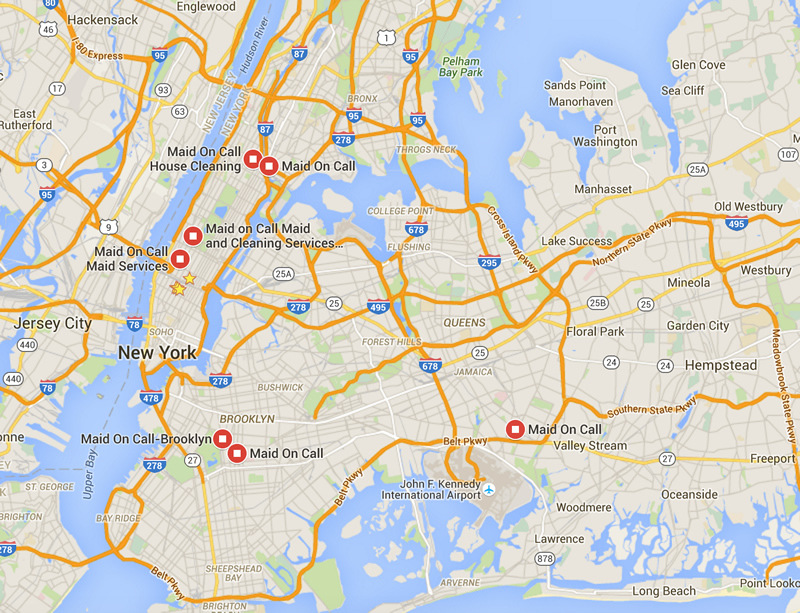 Serving the following areas: New York all boroughs. Brooklyn Bay ridge, Brooklyn, Jamaica, Woodhaven, Jackson Heights, Regal Park, Woodside, Forrest Hills, Bayside, Queens Village, Richmond Hill, Laguardia Airport, JFK Airport, Astoria, Corona, Ridgewood, Maspeth, Glendale, Middle Village. Fiske Terrace, Kensington, Lefferts Manor, Manhattan Terrace, Mapleton, Midwood, Ocean Hill, Ocean Parkway, Parkville, Pigtown, Prospect Park South, Remsen Village, Clinton Hill, Mid wood, Mill Basin, Crown Heights, East New York, Coney Island, Marine Park, Bayridge Boerum Hill, Bedford, Brownsville, Ditmas Park, Ditmas Park West, Ditmas Village, East Flatbush, Red Hook, Sunset Park, Homecrest, Gravesend, Gerritsen Beach, Brighton Beach, Bath Beach, Dyker Heights, Fort Hamilton, New Utrecht, Bronx City Island, Co-op City, Baychester, Eastchester, ParkChester, Fordham, Kingsbridge, Highbridge, Bensonhurst, Park slope, Manhattan Beach, Flatbush, Brooklyn Heights, Dyker Heights, Down town Howard Beach, Far Rockaway, Fort Greene, Ocean Hill, Brownsville, Carroll Gardens, Red hook, Borough Park, Brighton Beach, Sunset Park, Navy yard, Williamsburg, Mott Haven, Soundview, Kingsbridge, Riverdale, Tremont, Van Cortlandt Park, Long Island Hempstead, East Meadow, Westbury, Massapequa, Valley Stream, New York City Manhattan, New York City, Lower Manhattan, Village, Midtown, Up Town, Upper East Side, Harlem, New Jersey Plainfield, West Plainfield, Newark, Rahway, Linden, Woodbridge, Iselin, Jersey City, Society Hill Jersey City, Hoboken, Queens Flushing, Ozone Park, Hillside, Farragut, Greenpoint, City Line, Cypress Hills, East New York, Highland Park, New Lots, Spring Creek, Starrett City, Paerdegat Basin, Mill Island, Georgetown, Bergen Beach, Barren Island, Sheepshead Bay, Sea Gate, Plum Beach, Rugby, Stuyvesant Heights, Weekville, Wingate, Bush wick, Cobble Hill, Dumbo, Gowanus Rambo, Red Hook, Vinegar Hill, Windsor Terrace, Brooklyn Navy Yard.